Connoisseurs of Carnatic music for sure would love “Krishna Ni Begane Baro” - a famous classical song in Kannada Language. It is composed in Raagam: Yamunaa KalyaaNi by Vyasatirtha. 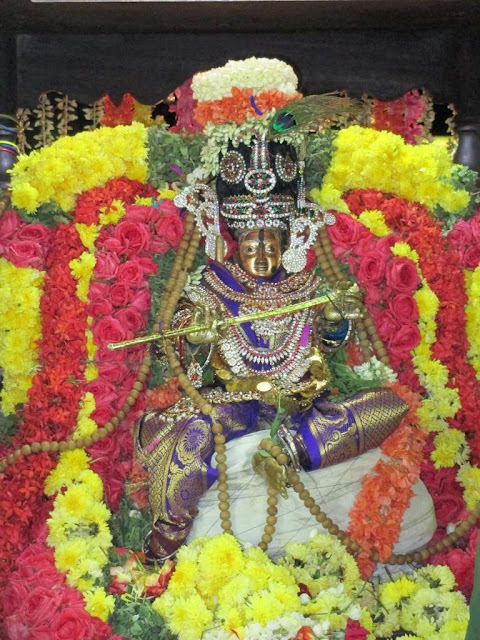 The beautiful song has the lines --- .. jagadOddhAraka namma Udupi Sri Krishnaa’….. – a song on Lord Krishna at Udupi composed by Vyasaraya Tirtha. Vyasaraja Swamin is acclaimed as one of the three spiritual lights or munitrayam of dvaita Vedanta, i.e., Sri Madhvacharya, Sri Jayatirtha and Sri Vyasatirtha. He is regarded as one of the foremost dialecticians in the history of Indian philosophy. He along with Swami Jayatirtha, helped in systematizing Dvaita into an established school of Vedic thought. Udupi lies in the south-west of Karnataka and is the headquarters of Udupi District. It is famous for the Krishna Mutt. According to legend, there was a storm in the sea at Malpe. Shri Madhvacharya was on the shore at the time and saw a ship which was in trouble. He helped the ship reach the shore to safety. The sailors were very grateful to him and gave him deities of Lord Krishna and Lord Balarama. 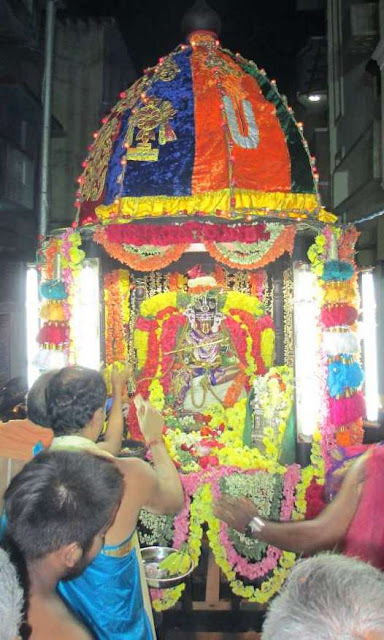 He installed the deity of Lord Balarama near Malpe. 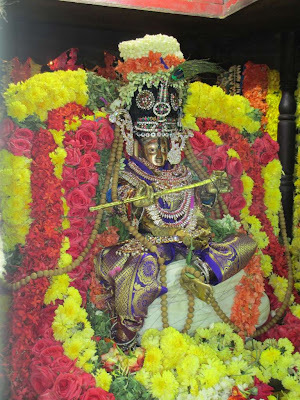 This temple is known as Vadapandeshwara. He brought the deity of Lord Krishna and installed at Udupi, which is regarded as the present day Krishna Mutt. The Mutt reportedly resembles a living ashram, a holy place for daily devotion and living. Surrounding the Sri Krishna Matha are several temples, the most ancient being made of basic wood and stone of 1,500 years origin. Pejawar is a village located in the Mangalore taluk of Dakshina Kannada, formerly known as South Canara. It houses one of the eight ashta Mutts established by Sri Madhvacharya. 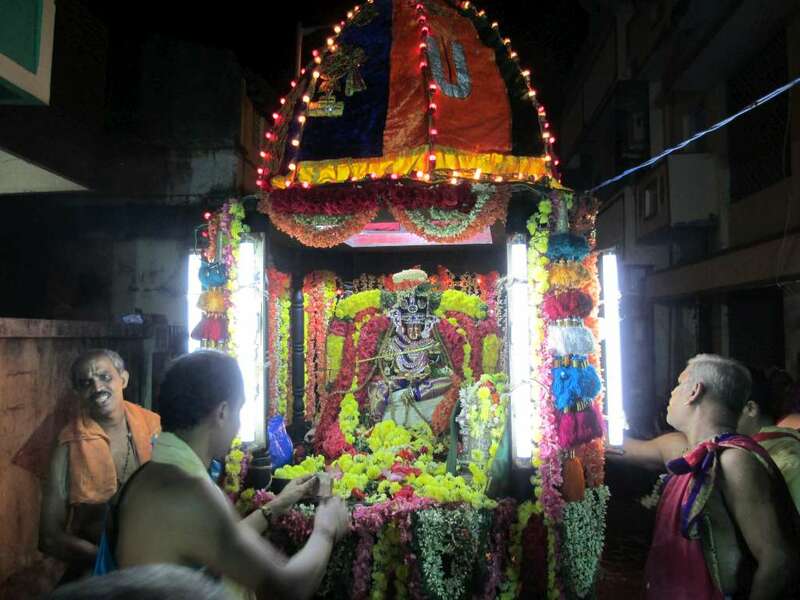 In Triplicane, there is a branch of the Udupi Krishna Mandiram situate at Sunkuvar street. The day of birth of Lord Krishna is celebrated all over, in a manner that Lord Krishna is born in every house. People celebrate at home by painitng the footsteps of little Krishna in their houses, have the vigraha of Krishna adorn new clothes and offer choicest dishes and fruits to the Lord. Similarly, the birth of Lord is celebrated as ‘Sri Jayanthi’ in very many temples. The day after Gokulashtami Lord Krishna idol of the Udupi Mutt at Thiruvallikkeni was taken on a rath and here are some photos of that purappadu. Tailpiece : Udupi cuisine emanating from Udupi is a world-renowned cuisine of South India. Udupi cuisine comprises dishes made primarily from grains, beans, vegetables, and fruits. It adheres strictly to the Satvik tradition of Indian vegetarian cuisine, using no onions or garlic. Pumpkins and gourds are the main ingredients in sambar, a stew prepared with ground coconut and coconut oil as its base. Udupi or Udipi restaurants and hotels serving Udupi cuisine can be found all over India and many parts of the world. In the past, these restaurants were run by cooks and priests trained at Krishna matha at Udupi. With rising popularity many hotels have sprung up in every nook and corner claiming to serve authentic Udupi cuisine and having the name Udupi on its nameboard.